Rolf Suey - Better Late Than Never: To the Fore 破風 – Not just about cycling, It’s about Life! To the Fore 破風 – Not just about cycling, It’s about Life! I watched the movie "To The Fore 破風" two weeks ago with my wife. It is uncommon for us to watch a Chinese movie on big screen, but I heard some good reviews for this movie, so we decided to give it a go. 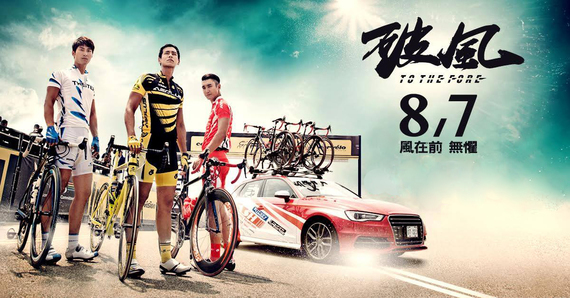 The movie depicts three young cyclists making inroads to become professionals, and their inner struggles, and how they eventually overcome the obstacles in their life to become a better person. My expectation for this Chinese-Korean idols movie is not high, as my initial intention is to focus on the cycling competition and the beautiful sceneries settings, where the movie was filmed. I confessed that at times, the show can be a little bit slow and idolistic for me. But overall it was a very good movie, heart-warming and down to earth. I was particularly enthralled by the 3 meaningful stories/scenes in the show which trigger my writing here. But before you understand the stories, you need to know background of cycling team. In cycling, team members have different specializations. Sprinter, lead-out, climbling specialists, time trial lists etc. In this movie, we focus on sprinters and lead-outs. Sprinters – someone who can finish a race very explosively by accelerating quickly to a high speed, often using the slipstream of another cyclist or group of cyclists tactically to conserve energy. Lead-out – a support role who normally has enormous stamina and he will lead for most of the race so that the sprinter and his other teammates can conserve energy due to the lesser air resistance by following behind. Closer to the finishing line, the lead out will be exhausted and he will sidestep to allow the sprinter to dash towards the finishing line. Often, the lead-out will also form a lead out train to reduce chances of other riders in competition attacking. Eddie Peng explained to his girlfriend Wang Luodan in the show that he wanted to be the world champion and said this. I think this is extremely true not only in dreams, but many things in our life. It includes our life-time partner. One of my best friends is still single and he has been single for many years. While I knew he wanted to find a partner, the biggest problem lies with him himself who resign to fate that he will be alone. And worst of all, he is almost doing nothing now to find one, while only devoting all his time on work. On the contrary, I have another good friend who was married in his 40s while being single for many years. What is admirable is he never stop looking for his next half. I remembers many years ago, each time he sees me, he will ask if I have any girl to introduce to him. Finally one day he was open-minded and went out with a woman he does not like at all, for a hiking gathering. It was through that hiking, he managed to know his current wife by random chance. Many of my friends who are already married faced difficulty in conceiving. Those who gave up never have one till now. Those who really want a kid and try many times via various methods, succeeded. I had a friend whose wife has a unique medical condition deterring her chance of having a baby. In fact, she tried, and was pregnant several times. Sadly, she also went through miscarriage several times, until she was finally successful. However it was not without sacrifice as she had to inject herself with medicines throughout her pregnancy. It was all worth it for her family as she was so happy with her only child. Otherwise, if you really like children but can't, adoption is another possibility which my wife’s colleague did that as well. Therefore think again and ask yourself what is really important in your life? Devote your time to it and make the chase nearer. Shawn does not know the answer initially. Do you….? You will find out as follows. The movie started with Eddie and Shawn as indispensable lead-outs supporting Choi Siwon as the sprinter/ finisher in a Taiwanese Category III team Radiant. Three of them later split with all becoming sprinters in their new team. Eddie and Choi compete head to head while Shawn started initially as lead-out in his new team. Later, due to his bad temperament, Eddie was banned for a long period of time. During this time, Shawn is tired of playing the second-fiddle role and also wanted to be Champion sprinter like Eddie and Choi. However Shawn has an inherent medical condition that restricts his sprinting ability. To overcome this shortcoming, he resorted in drugs. He continues to win many races. On one occasion, Shawn collapse after winning a race as result of drug overdose. While the drug is not an international banned drug, he felt ashamed for his wrongdoings and ran off from reality and competition to indulge in gambling and alcohol. Eddie went to Korea to persuade and Shawn out of his misery and they regain their composure to race again and win as team and more importantly as good friends. Shawn finally enlighten on the answers why rabbit lose again in race 2 with tortoise. This is because rabbit did not even participate in the race! Rabbit and Tortoise are so different. There isn’t any need at all for them to race and compete. They are in different leagues. You need to know your strengths and who you are! Shawn eventually seeks his dream as a long distance cyclist and not a sprinter anymore, since his strength is his good stamina and never his sprinting ability. 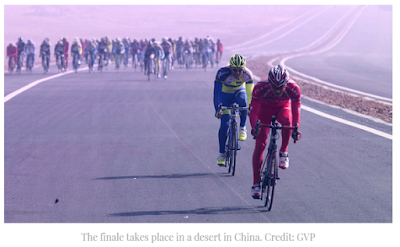 The setting for the final race is in the Tengger desert in China Inner Mongolia. It is a grudge match between Eddie and Choi. Shawn is in Eddie’s team as his lead-out. Towards the end of the race, Eddie attacked early to start his sprint. Choi follow suit early as well. Both sprinters were head to head and energy drained out quickly. In an unexpected twist, while it seems that either Eddie or Choi will be the champion, Shawn who was behind all along to conserve his energy, overtakes and sprint towards the finishing line first. Choi was in a daze. This is the strategy of Eddie and Shawn from the start to distract Choi, so that Shawn can be the unexpected winner. Choi was beaten convincingly by two good friends. Winning is not all important here. Friendships and togetherness are. Eddie and Shawn win together as a team! “To the Fore” is quite unconventional. For all I thought was cycling and action-packed, its main focus is not just the sprinters or lead-outs competing. Instead, the show underlines the ups and downs in life or career, and the mental strength needed to overcome them for the greater eventual success. There is also a time to take the lead, and a time to step back for the greater good!